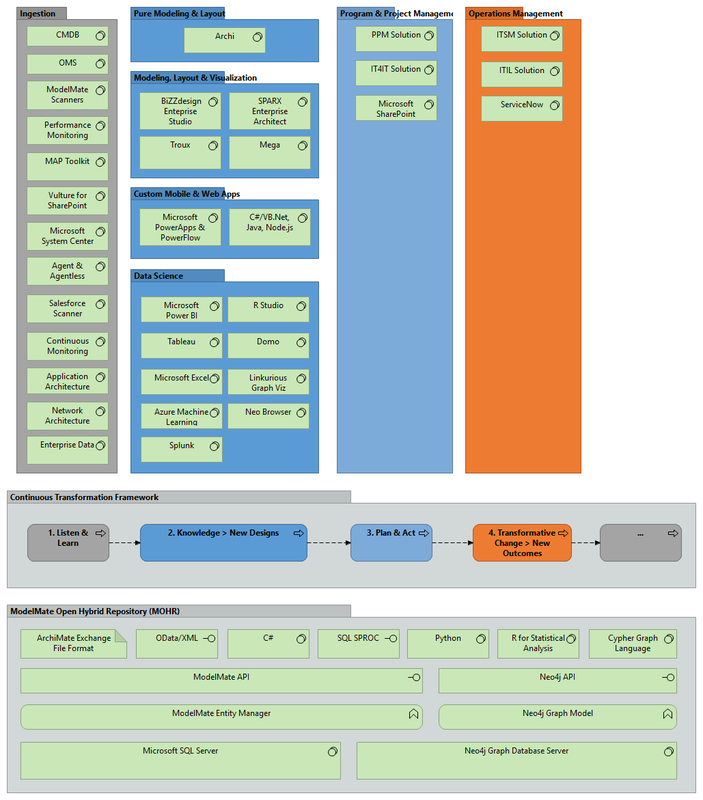 This article describes the architecture reference model for deploying a comprehensive, integrated enterprise architecture modeling and data science platform based on ModelMate. The audience for this article is IT professionals including enterprise architects, solution architects, and security architects who want increased visibility into the deployment of their custom applications, entire data center environments, business process definitions, and LOB applications such as SAP, Oracle Financials, Salesforce, Microsoft SharePoint, and Microsoft Dynamics CRM. A primary use case is organizations with a requirement to move one or more on-premise applications or capabilities to the cloud or need a better understanding of how their hybrid on-premise/cloud environments (e.g. Salesforce cloud applications and on-premise or third-party customer loyalty solutions). 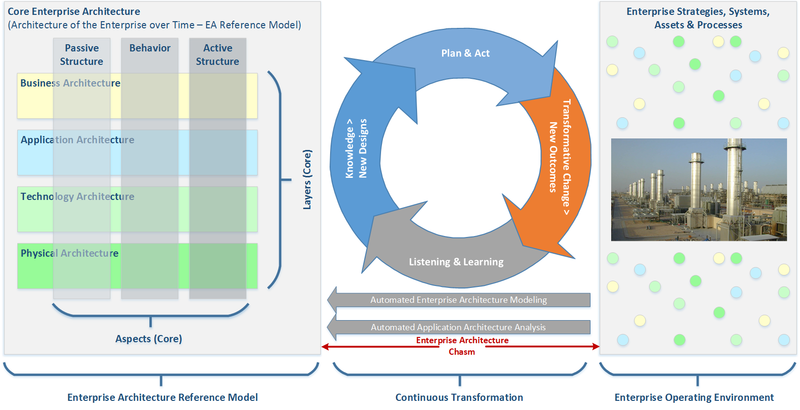 The primary goal of ModelMate is to provide automated support for the Continuous Transformation Framework of the Progressive Enterprise Architecture Model (PEAM) depicted in Figure 1. The Framework is depicted as a continuous cycle as shown in Figure 1 above. The Framework can also be flattened and presented as a (repeating) sequence of 4 processes (Figure 2). Why all of this discussion about PEAM and the Continuous Transformation Framework? It is because to be able to understand and value the ModelMate Architecture Reference Model, it’s important to understand the class of problems it is trying to solve. Automated support for Continuous Transformation is the pain; ModelMate is the pain killer. These 3 layers (and 4 categories of apps) are illustrated in Figure 3. Each app category corresponds to one phase in the Continuous Transformation Framework. Figure 4 lists a sample or representative list of applications that can fulfill the needs of each app category (each phase of the Continuous Transformation Framework). Ingestion apps are responsible for scanning the enterprise’s operational environment: systems, assets, and processes. Information captured about each entity includes its structure, metadata, performance and usage data. Operational business data is usually not needed and not captured. Sources of data include business process logs, configuration management databases, LOB application configurations (SAP, SharePoint, Salesforce, Microsoft Dynamics CRM, Oracle Financials, etc. ), operations management systems (Azure OMS, Microsoft System Center, etc. 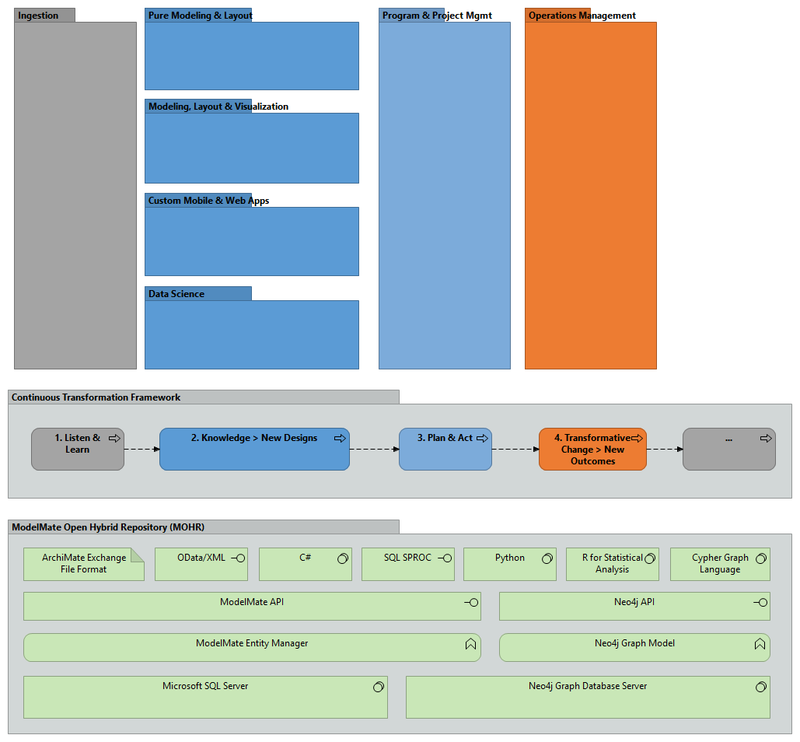 ), Microsoft MAP Toolkit, performance monitoring logs, usage and audit logs, etc. These are inbound data sources used to automatically update and maintain the EA models stored in ModelMate. Ingestion apps are the primary data sources for the Listen & Learn phase of the Continuous Transformation Framework. There are several types of apps that comprise the Knowledge > New Designs phase of the Framework. Pure Modeling and Layout Apps are applications that support the manual modeling of entities, relationships, and metadata as well as the manual layout of stakeholder specific views. The apps in the group do not support any built-in analysis and visualization capabilities beyond manually-created basic views. In addition, pure modeling and layout apps do not include an end-user scripting capability for performing automated, user-defined custom analysis or visualization. Archi is an example of a pure modeling and layout app. These types of apps support manual modeling of entities, relationships and metadata and the manual layout of stakeholder specific views but also include basic, advanced, and/or custom analysis and visualization capabilities. BiZZdesign Enterprise Studio and other advanced EA modelers are examples of apps that belong to the Modeling, Layout & Visual Apps group – supporting the needs of the Knowledge > New Designs phase of the Framework. Data Science Apps include non-traditional “enterprise architecture” modeling and analysis apps. This group includes both open sources as well as COTS (commercial off the shelf) data science tools and platforms. Data Science apps provide advanced analysis, machine learning and visualization capabilities enabled through open access to enterprise architecture data via standard protocols and APIs (e.g.ArchiMate Exchange File Format, OData, SQL Server stored procedures, entity models, and advanced query and analysis languages such as R, Cypher, and T-SQL). Examples of Data Science apps include: R Studio, Microsoft Power BI, Tableau, Domo, Linkurious, Microsoft Excel and the Neo4j graph browser. This is the last group of apps that support the Knowledge > New Designs phase of the Framework and includes both no-code and code platforms for creating custom reporting, analysis, visualization apps. Program & Project Management Apps support the Plan & Act phase of the Framework. Traditional portfolio, program, and project managements apps are examples of applications in this group. Collaboration tools such as Microsoft SharePoint, Confluence, and Jira can also belong in this group. Collaboration tools can also be considered as “horizontal” solutions that can be used across all phases of the Framework. All of the effort to create and manage a functioning enterprise architecture solution only realizes direct business value when it leads to Transformative Changes being made in the enterprise’s strategies, systems, assets, and processes; and measurable, positive New Outcomes result from the changes. Examples of apps in this category include change management applications that support IT Service Management (ITSM) disciplines such as ITIL. ServiceNow is an example of an ITSM app. Please provide your feedback in the Comments section below or feel free to email me directly.